This is a great product and we are proud to introduce it on Music4us.com. The course is easy to understand and you get quick results on technique and style. The DVD illustrates Breathing, Support, Focus and more. 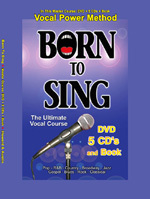 Included also are 5 CDs: Technique, Style, Vocals, and 30 minute Exercises for high and low voice. TECHNIQUE CD covers: * Breath support * vibrato * range * resonance * pitch accuracy * falsetto * head voice * chest voice * smoothing out the 'break' between registers * volume control * projection * holding notes & long phrases... and more. SING-AEROBICS CD - 30 minute daily work-out / High & Low voice - Warm up at home or "on the road".